John: I was lucky enough to attend the tour twice: first in Anaheim, California (near Disneyland). The bands were excited that the 1700-capacity venue, the Grove, was sold out. And the crowd was clearly excited, lining up early, jumping, screaming, waving, and singing along with the bands. Of course, there were lots of Nightwish shirts, but also lots of Delain shirts, which is great for an opening band and bodes well for their plans to headline soon. C.: After a long bus ride all morning and meeting up with a friend to ride the rest of the way, I made it to The Grove around 4 o’clock. I had an all-access pass waiting for me when I got there, which allowed me early entry into the venue. Because of this, I not only got to meet the Nightwish bandmembers before the doors opened for the VIP guests, but I was also able to watch Delain’s soundcheck. I made sure to get right up to the front so I could see everything! The band sounded great, and they played half of the songs on their setlist during the soundcheck: “Suckerpunch” (the new single), “Mother Machine”, “We Are the Others”, and one of my favorites, “Don’t Let Go”. Watching Delain perform these songs and to be virtually the only person in the room (aside from the obvious crew hands and stage personnel), it almost makes you feel like they are putting on a special show just for you; especially when you see their fun and spirited interaction between each other, like Merel doing a dance where she’s kicking up her legs while trying to play a ripping guitar solo, or Charlotte and Timo hugging it out or jumping around. It shows that their onstage chemistry is not just for show and that they have a genuine affection for each other. This just heightened my anticipation for the actual concert! 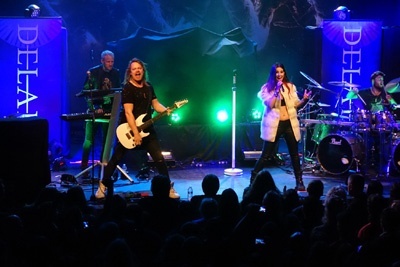 John: The show started with Delain, who were in fine form despite rumors of persistent illness for everyone on the tour. This was my first time to see Delain’s new guitarist, Merel Bechtold. She’s a great addition to the band: Delain really needs two guitars to do their material justice, and she is a fun presence on stage. Of course, Timo sounded great too. Absent was bassist Otto Schimmelpenninck , who was in the Netherlands having a baby (congrats to him! ), so his part was on the backing track. I missed seeing him, but it sounded fine. Charlotte Wessels was of course the center of attention, and she sounded fantastic. My only regret is that the setlist was short (8 songs), and the songs didn’t show as much variety as Delain’s repertoire as a whole, especially since we didn’t get a song with Marco Hietala in Anaheim. It was fun to hear the new songs from Lunar Prelude for the first time live (“Suckerpunch” and “Turn the Lights Out”), but I would have substituted something from Lucidity for “Don’t Let Go” (maybe “Silhouette of a Dancer”). Regardless, I loved Delain’s show as always. 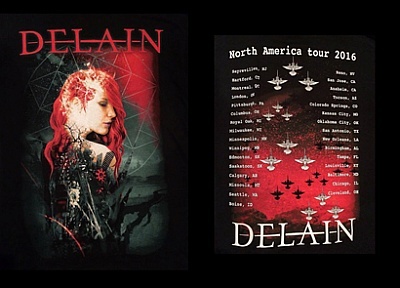 I also love my new Delain tour shirt, with a red cyberpunk painting of Charlotte on the front and hummingbird bombers on the back. C.: The darkened room was illuminated with a blue light. Atmospheric music swelled to a crescendo and the sound of Charlotte’s chanting vocals filled the room as the curtains drew back and one by one, each bandmember hits the stage. Ruben takes his place at the drum kit, and then Martijn steps behind the keyboard. From either side of the stage, Merel and Timo step forward with their axes in hand. Then Charlotte is the last to appear, and the crowd goes completely ballistic as she appears in a white fur coat-looking jacket and a midriff-baring tank top and a mic stand that is lit up and gives the appearance of being studded with little diamonds. The room goes completely dark again and there is a dramatic pause, then the opening notes of “Suckerpunch” fill the air and Delain is on fire from the word “go”. Even though Otto was missing from the lineup, the band sounded terrific and did not suffer greatly from his absence (but it will be nice when he can return to the fold!). I cannot add much to the discussion by way of my opinion of new guitarist Merel, so I will simply say that I concur with everything John T. has written. John: Incidentally, I read another review of the Anaheim show which said that Delain sounded great and got a great crowd response but isn’t really metal. I disagree. I prefer a broad definition of metal, and Delain's guitars are more aggressive than ever in the last couple of albums. Their guitars and rhythms are also way heavier than ‘80s pop metal (and generally too heavy for non-metal fans like my wife). But their songs are definitely catchy! One of my Facebook friends, Ben Brogan, explained it best: “Delain is not too heavy or light. They're perfect. 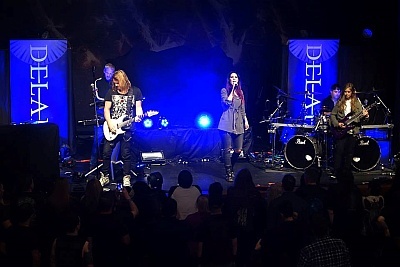 Delain is contemporary-symphonic-melodic-rock-avant-garde-pop-metal, with classical-atmospheric influences.” Another friend, Chip Moody, said the same thing in fewer words: “Metal with strong pop undercurrents.” Whatever the label, it works. 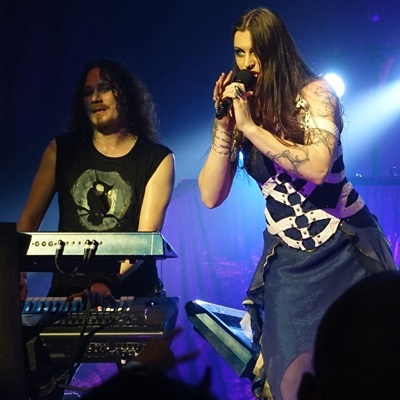 C.: This was my 3rd time seeing Delain and while they put on a fantastic show, I will also agree with John that I wish the setlist would have had a little more variety. If there were any disappointments at all (and I am really nit-picking here, because overall, the show was anything but a disappointment! 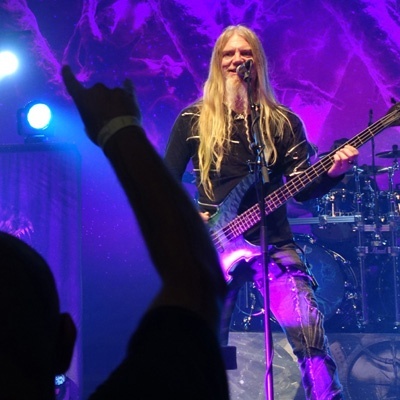 ), I was a little saddened that Marco Hietala did not come out to sing one of his numerous duets with the band. Then again, considering that the gig in Boise several days before was cancelled due to illness, and seeing the band myself before the concert, they still looked very much under the weather, so I do not blame Marco for wanting to preserve his voice for his own performance later that evening. That being said, I will also agree with John T. that 8 songs was “Not Enough” (pun intended). They have not deviated much from the fan favorites (i.e., “We Are the Others”, “Mother Machine”, etc. ), but there were 2 new songs and we got to hear them both (“Turn the Lights Out” was phenomenal). However, I will respectfully disagree with John T. when he says he would have liked to see “Don’t Let Go” switched out for another song. “Don’t Let Go” is one of my favorite Delain songs, and they did not play it at the Greek Theater show last year, so I was very happy to hear it. However, seeing as how they did play “Army of Dolls” at the aforementioned show in 2015, I would make a compromise with John T. and say I would have rather seen that song switched out for something from Lucidity (like “Sever”, which is my favorite Delain song). As always, “Not Enough” is the perfect show closer for Delain; those notes that Charlotte hits at the end are so beautiful and they hit you in just the right way. John: After Delain came Sonata Arctica, which isn’t the focus of this zine, but I enjoyed them. Then it was time for Nightwish. Their show was just perfect. Despite their illness (which forced a rare show cancellation a few days before), they sounded fantastic. Floor’s voice was clear and powerful; the setlist was excellent; and lightshow was a great accompaniment. I especially enjoyed hearing “Bless the Child” for the first time live with Floor. I am also loving the new album more and more, especially live. “Shudder Before the Beautiful,” reminiscent of “Dark Chest of Wonders” is a perfect opener, and “The Greatest Show on Earth” is the perfect dramatic closer. It, and “Last Ride of the Day,” are two songs that don’t feel like a letdown after the epic “Ghost Love Score,” my longtime favorite. Other highlights in the set included “Sahara” and the classic “Stargazers.” My only complaint is the addition of flutes to “Nemo.” I love Troy’s other additions to the band, but I think the flute in “Nemo” dilutes its powerful simplicity. Anyway, it was a fantastic concert, and I really enjoyed experiencing it with a first-timer friend who has been wanting to see Nightwish for 10 years. 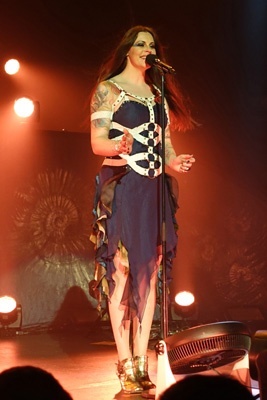 C.: I will try not to get too long-winded about Nightwish, but as you all know, I am a huge fan, so I probably will not succeed at making this short and to-the-point! This was my 9th Nightwish concert (to which, when I mentioned this to Tuomas during our short meeting earlier in the evening, he responded, “when is show number 10?” I wish I had an answer for him, but it probably won’t be until the next tour, I am sad to say). I have seen the band with all 3 singers, and I have to say, even after seeing them so many times, I never get tired of it and they always put on a brilliant show. Once again, I am really stretching here when I try to think of any downsides to the show, and it is only one at that: it seems that they are starting to break with their tradition and not include “Higher Than Hope” in their setlist whenever they come to Southern California, which is something that I have always enjoyed looking forward to. (Maybe the band had to retire it for a while and will bring it back on the next tour?) But, they made up for it in other ways by including other songs I have wanted to hear live for many years, such as “Bless the Child” and “While Your Lips Are Still Red” (both would definitely be considered highlights of the show). Also, I was glad to see “Amaranth” dropped from the setlist and replaced with “Sahara”, one of my favorites from Dark Passion Play and one I have wanted to hear Floor sing ever since she joined the band. I also like that they are starting to utilize Troy a lot more other than have him just sit on a stool until it’s time to play his parts, like when he gets down on the bouzouki during “Weak Fantasy”. I like the additional pipes during “Nemo”, and the pipes add some charm and personality to a few of the other older songs as well. The new songs are amazing live, so if you are not a fan of the new album, I would highly suggest going to a show to hear these songs, because it might just change your mind. Personally, “My Walden” was probably the most fun and energetic of the new songs, but “The Greatest Show on Earth” is just transcendental. Of course, hearing old favorites like “She is my Sin”, “Stargazers”, and the epic “Ghost Love Score” are always a plus; though I do wonder if the day will ever come that I will get to hear Floor sing “Wishmaster”. (Guess that gives me an incentive to reach show #10!) I must also add that the band is a lot more playful onstage over the last few years, and it’s great to see them having so much fun. Whether it’s Floor executing her metal stage moves in high heels, Emppu flying from one end of the stage to the other, Marco interacting with the audience between songs, or Tuomas orchestrating everything from behind his keys as he headbangs with gusto and mouths along with the lyrics; Nightwish not only makes sure you have a good time, but it is clear when you watch them onstage that they are enjoying themselves as well. From start to finish, Nightwish puts on a hell of a show and the only negative aspect to it is that it has to end eventually. It probably won’t be for another few years, but I can’t wait for show #10! John: Nine days later, it was time for me to see the show again, this time with my dad in my hometown of Birmingham, Alabama. I buy my dad a metal CD almost every year, but we haven’t attended a metal show together since he took me to see Kiss in Birmingham as a kid, so it was a special experience for me to share my favorite hobby with him. I was also happy to find so many symphonic metal fans in Birmingham. The venue, Iron City, was also great, with a friendly staff and many great viewing spots. Martijn Westerholt told me that Iron City had been really helpful and friendly to the bands too, giving them good food and showers. Troy Donockley also commented to the crowd that Birmingham was the most metal city, since it was founded to make steel and named for Black Sabbath’s hometown in England. The show was much like Anaheim, except this time Marco joined Delain for an excellent rendition of “Sing to Me.” Marco and Charlotte also asked the crowd to sing to them, which we did. 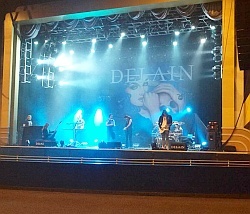 I was also able to get in early enough to hear Delain’s soundcheck, which was fun and sounded great. 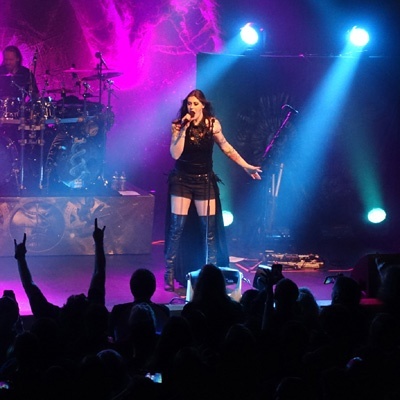 Two highlights of Nightwish’s setlist were also added from Anaheim: “Everdream” and “Wishmaster.” It was also great to see how much fun Floor is having in the band; she is clearly integrated, comfortable, and happy. After the show, Delain came out to meet fans as they always do. 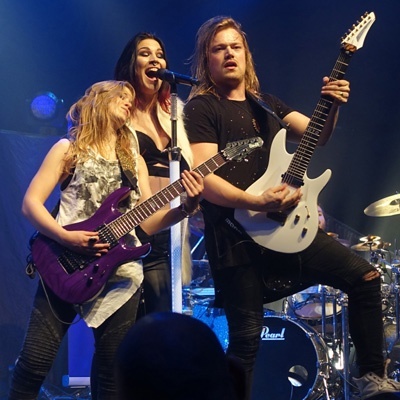 I had the chance to talk to Charlotte, Merel, and Martijn, who told me that Delain is hoping to be back for a U.S. headlining tour next year! I hope so too. As for now, “We Were Here”! Photos provided by John Thornburgh, except where noted.